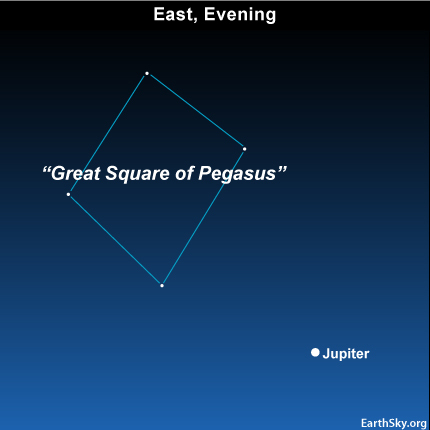 A fixture of the autumn night sky, the Great Square of Pegasus appears to the upper left of the blazing planet Jupiter at early evening. For some idea of the Great Square’s size, extend your hand an arm length from your eye. These stars are far enough apart so that the width of your hand should slip in between any two Great Square stars. 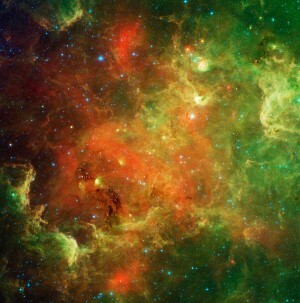 By the way, if you are a baseball fan, you might imagine these four stars as a celestial baseball diamond. Every year, the Square of Pegasus lights up the eastern sky on October evenings. Learn the Great Square of Pegasus tonight, and you can use these stars to star-hop to the Andromeda galaxy, the closest spiral galaxy to our Milky Way. Jupiter and the Great Square swing high into your southern sky by around midnight, with Jupiter shining beneath the Great Square. Then, in the wee hours before dawn, Jupiter and the Great Square sit low in your western sky, with the Great Square of Pegasus shining to the upper right of the blazing planet Jupiter. Throughout October 2010, Jupiter acts as your guide “star” to the Great Square, and the Great Square serves as your signpost to the Andromeda galaxy! Previous Story: EarthSky Tonight—Sept. 30, What bright star flashes red and green in northeast? Site contents copyright © 2019 Recorder Online	except as noted. All rights reserved. | 88 queries in 2.190 seconds.